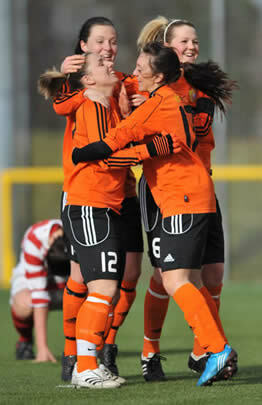 Glasgow City picked up three points away from home today with a 3-0 win over Hamilton Accies. With four changes from the side which lined up against Celtic last Thursday, City dominated the game but a lack of spark and a resilient Accies defence made it difficult for the Champions to find their fluency. City created a number of chances throughout the match. Jane Ross in particular came close in the opening few minutes firing over from the edge of the box and then a minute or so later, controlled a Kat Lindner cross well on her chest, but fired her effort over the bar. City took the lead on twenty minutes when Sue Lappin headed home a City corner. A few minutes later, Lappin almost doubled her side’s lead when she headed an Emma Fernon free kick towards goal, but her effort was saved by Lee Alexander in the Hamilton nets. Ten minutes before half time, another City corner caused the home side problems as Lappin flicked the ball to the back post and Jane Ross fired over under pressure from the Accies defence. A minute later, Ross was in the thick of the action again as she got her head to a Lindner cross, but headed just wide. Just before half time a good turn by City striker Suzanne Malone at the edge of the box, released Jane Ross, but her effort was well saved by Alexander to keep her team in the game. Ross once more nearly got the second as a good pass from Megan Sneddon, released Emma Fernon and as she sent in a tantalising cross, Ross stretched for the ball to try and guide it towards goal, but Accies did just enough to clear the ball to safety. At the start of the second period, City continued to attack the home side and almost added to their advantage in the opening seconds when an excellent run and cross by full back Emma Mitchell almost sneaked under the back post with Alexander beaten. Five minutes into the restart and Jane Ross broke down the left hand side and fired a cross into the Accies box which was handled by Lauren Emmerson and the referee pointed to the spot. Up stepped Ross herself, but saw her effort saved by Alexander low down to her left. 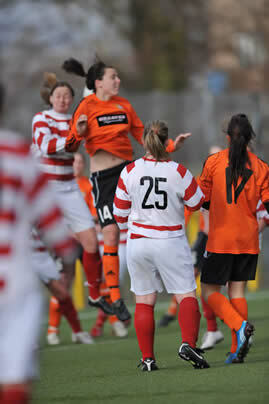 A great touch by Lappin then released centre half Rachel Corsie, but her effort was saved by Alexander. On 55 minutes, Emma Fernon tried her luck against the on-form keeper, but her free-kick was saved by Alexander once more. 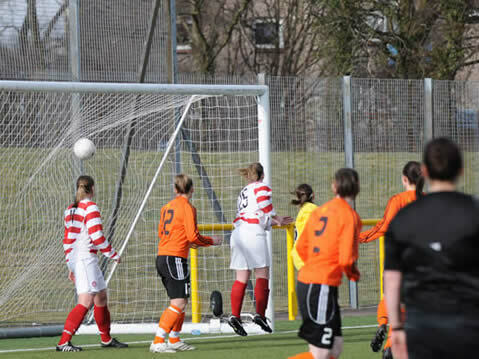 Accies then had their first clear effort on goal 17 minutes into the second half when Susan Fairlie fired high from distance. Two minutes later Emma Mitchell got to the by-line and whipped in a fantastic cross which just evaded the diving head of Lindner, but was well struck by Sneddon at the back post, but she was denied once more by Alexander. Sue Lappin then had the ball in the back of the net as she stroked home a City corner, but to the bewilderment of the City support, the ref blew for a foul somewhere in the box. Suzanne Malone was next to go close for the visiting side, with a good turn at the edge of the box, but fired her effort over the bar. Hamilton then broke up the pressure, winning a corner kick , but the resultant set piece was headed wide. With fifteen minutes left, City made five changes with Donna James, Lisa Evans, Leanne Ross and Leeanne Campbell all coming on, closely followed by Lauren McMurchie. 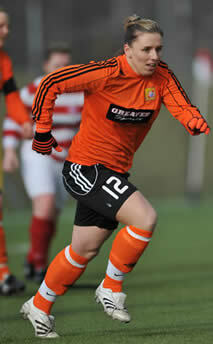 It turned out to be inspired substitutions, when Donna James first touch was to control a cross from Sneddon and her second was to fire it past Alexander for her first goal since re-signing for Glasgow City. With eight minutes left, Lappin finally got her second goal of the game and her side’s third, when she volleyed home a Fernon corner. The City midfielder almost got her hat-trick right at the end of the match, when a great pass by James, released Leanne Ross, who brilliantly beat the full-back and set-up Lappin in the box, but the midfielder fired over the bar. City Head Coach Eddie Wolecki was happy with three points. He said, “We responded well from the disappointment midweek, kept a clean sheet and scored three goals against a stuffy Hamilton team. We took a while to get the second goal, but we always looked in command of the match and I am delighted to once again be able to fully utilise the squad and pick up an important three points.